Our goal is to exceed our client’s expectations in every detail of their private travel experience. Each trip is handled with professionalism, commitment, and the highest quality of customer service. Onyx jet group provides the level of service demanded by our clients. Additionally, Onyx Jet Group can help our clients evolve from their first charter to aircraft ownership. Our expertise allows us to manage your aircraft thus generating a revenue stream. Onyx Jet Group provides the most competitive pricing on empty legs and one ways on all aircraft types. We fill a void in the private jet market place offering a full service boutique aircraft group. We are committed to the safest, newest, and most cost effective way of flying private. Fly with us as often or as little as you like as we must earn your business on each trip. Each aspect of your trip can be fulfilled through Onyx Jet Group. Our private travelers are able to focus on their desires whether it is for business or pleasure. Our diligence ensures our clients will be assisted anywhere and at anytime. Onyx jet group strives for client satisfaction. We will stop at nothing short of the highest level of service our client’s expect. 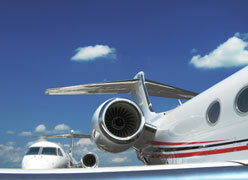 Onyx jet group has a combined 30 years of experience in private aviation. We continually educate ourselves on current trends in the aircraft charter and sales markets. Our vision encompasses a complete mastery of aviation in today’s private sector. Onyx Jet Group will continually reinvent itself to compete with the emergent industry of aviation.